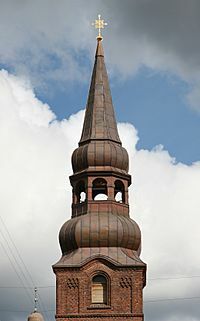 A steeple is the tower at the top of a church, which is a building or temple of the Christian religion. It often has a cross at the top, in memory of Jesus' crucifixion. Steeple Facts for Kids. Kiddle Encyclopedia.